We gather the last Sunday of every month, and the Sunday mornings in-between we gather for church in different small groups in homes and coffee shops around the city. We don’t just do it to be different, we think there are things that can only happen in a small group that cannot happen anywhere else. Especially service. 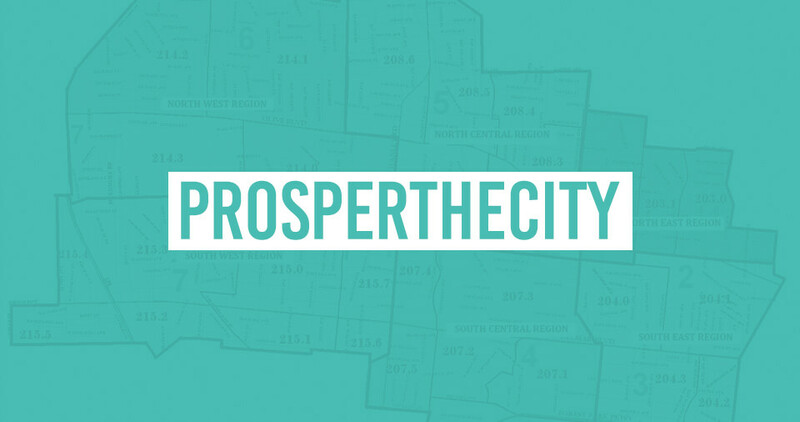 To test it out, this month for our series called Prosper the City we transformed all of our Small Groups into Prosper the City Teams and told them to spend three Sundays to create a project before the fourth Sunday that would make an immediate impact in the neighborhood. We loved this series so much last year we decided to do it again this year. I love how Prosper the City Teams help people Rethink the Way You Church. That instead of church being something you visit every so often where you sit in rows and face forward listening to professionals give monologues, church becomes the verb it’s supposed to be. I love how Prosper the City Teams make the church more than a building in the background of the community and does something the community needs. Where people so value what the church does that they would grieve if we disappeared. And I love how it helps us live out and demonstrate a teaching of Jesus. This teaching of Jesus is kinda buried in a famous story of Jesus. In fact, all four of the biographies of Jesus in the Bible–Matthew, Mark, Luke and John–all four of them mention this story that sometimes called the Feeding of the 5,000. Maybe you’ve heard it before. But even if you haven’t, it’s pretty straightforward. Tens of thousands of people surround Jesus. And they’re so enthralled with his miracles and his claims and his teachings that they forget to eat and lose track of time. If you’ve ever binge-watched a show on Netflix and you’re like “how is it midnight already?… I guess I can watch one more.” That’s kinda’ what’s going on here. Now look at this. There’s times when Jesus is mysterious, this isn’t one of them. When he says, “You give them something to eat” what he actually means is “You give them something to eat”. But they miss what says because they assume what he means. When I was in Seminary, a school to be a pastor, they really hammered on not filling in the blanks for God or making conclusions on God based on what He doesn’t say. It is what it is, not what it isn’t. When we make assumptions of God, we can get twisted up actions pretty quick. So Jesus tells them “You give them something to eat”, they hear “You give ALL of them EVERYTHING they need to eat”. They turn around and count. Okay, let’s say there’s about two kids per family… about ten thousand here. A loaf of bread is 4 sheckels… that’s one, two, carry the ten… Matthew, taxman, you’re good with numbers, what’s that–a mont’s wages? Half a year? Okay, you tell him. Notice where they’re looking. They’re looking at what they lack. All they see is scarcity. 38 “How many loaves do you have?” he asked. With a simple question He shifts their minds from scarcity to abundance. From impossible to possibilities. From the loaves you need, to the loaves you have. Let’s role play this out a bit. No one here brought food, but that’s kind of the point. Anyone have any food? Breath mints? Chapsitck. I guess that would work in a pinch. And after they count what they have, they have 5 loaves of bread and 2 fish. And they bring what they have to Jesus. It’s small. But all Jesus asks for is what they have. They’ve estimated the size of the crowd. They’ve estimated how much they need. But they underestimated what He could do. what God can do through you. Because Jesus takes the five loaves and two fish and miraculously feeds the entire crowd. So much so, they collected basketfuls afterwards. The entire crowd eats and is satisfied.